To the memory of the innumerable martyrs of our Armenian people whose blood covers the whole of Anatolia. To the great company of saints who were victorious in death, keeping the faith. To all the millions who triumphed over this world. To those who now bear the trophies of victory around the Lamb slain for them and vanquishing the foe, rose again. I am greatly honored that my good friend, the Rev. Vartan Bilezikian, permitted me to read the manuscript of the book, “Apraham Hoja of Aintab”. Too little has been recorded of the sufferings and victories of that faithful company of Armenian Christians who bore the unspeakable persecutions of wicked men during the early part of this century. It is well that one who shared these experiences has been led by the Holy Spirit to write of these acts of modern apostles who followed in the train of the early martyrs. This volume is more than a narrative of those who dared to follow their Lord in full dedication of life and service. It is a daring, shocking, convicting indictment of the spiritual shallowness and lack of passion for God’s very best which characterizes the ease-loving generation of which we are a part. Do not read this book hastily or in the midst of the confusion and distraction of a busy day. Read it in the quiet of your chamber, read it slowly, read it prayerfully, that your own heart may catch fire and cause you to become a flaming witness. The story of the Armenian revival, preserved for us by the Rev. Bilezikian, is an inspiration to all who are interested in the sovereign movements of God’s Spirit in the history of the Church. It illustrates that the Spirit bloweth where it listeth. This revival would be unknown to us except for the record made by the Rev. Bilezikian. Revival often comes from sufferings or else is the prelude to suffering. Many of God’s people are praying these days for the last great revival of the age preliminary to the tribulation and the coming of Christ. The fact that thousands in mass meetings are hearing the Gospel would lead us to believe that the Church may be moving toward a period of suffering for which this is a preparation. This brief historical study will encourage your heart, inspire your labors and awaken a new interest in revival. This book which records the lives and works of some of God’s servants and saints is written with the sole purpose that it might strengthen the faith and be a blessing to those into whose hands it may fall. It is the aim of this book also to preserve the testimony and experience of these servants of God for the generations yet to follow. As in all ages of the Church, in which the Holy Spirit did mighty and wonderful works through consecrated souls, so during the first half of the twentieth century among our Armenian people the blessed Holy Spirit brought about mighty accomplishments through some obscure and weak instruments. It is the sober conviction of the author that it would not be rightly honoring those of yesteryears if we should permit their precious testimony to be lost. At the outset it may be said that to understand this book and appreciate its worth, it ought to be read through carefully and prayerfully. The spiritual hero of this book is Apraham Hoja Levonian of Aintab, Turkey. He was a man absolutely dead to self and separated from the world. He was unique, incredibly unique in a thousand and one ways. Of all the men the author has known, Apraham Hoja could make without reservation the apostolic claim: “I have been crucified with Christ; it is no longer I who live, but Christ who lives in me; and the life I now live in the flesh I live by faith in the Son of God, who loved me and gave himself for me” (Galatians 2:20). Though like his Lord and Master, he was rejected by men and misunderstood by them, none could withstand his power, nor resist his prophetic personality. They could not deny the mighty operation of the Holy Spirit in his life which resulted in the salvation of thousands, and in the spiritual vision and purification of the Church throughout the length and breadth of Central Anatolia. While Apraham Hoja was the leading figure and moving spirit there were many other worthy co-workers who suffered with him, some of whom are mentioned in this book. But many men and women, all of whom have reached their rest above, are too numerous to mention here. To Rev. M. Apkarian for securing the exact copy and form of Hoja’s last will and testament. All these brothers are now deceased. The author is under particular obligation to Rev. M. P. Krikorian, and would like to express his deep gratitude for the outstanding assistance he rendered in making a faithful translation. The text I wrote was in Turkish with Armenian characters. The translator skillfully rendered it into English, offering valuable suggestions, accomplishing a work I could not have done. The readers of this translation who are familiar with the Armenian text will certainly agree with me that Rev. Krikorian’s work has been done well. He has managed not only to preserve the spirit of the text, but has also rendered the thought, essence and atmosphere intended. In this book I abided by the principle to give glory to no one. For Christ’s is the kingdom and the power and the glory forever. It is my earnest hope that through these pages God will be honored. I add my prayers that this testimony will contribute to the salvation and spiritual awakening of many, both now and in the days to come. I also wish that young people in the coming generation will be benefited from this book and dedicate their lives to the supreme service of Jesus Christ. In November 1950 when I arrived in the USA at the age of twenty-seven, my uncle, Cosmas Cosmades, welcomed me at the port of New York and drove me to his home in Watertown, MA. I had the name and address of Reverend Vartan Bilezikian with me, given by a friend. Newtonville, where Brother Bilezikian and his wife, Sister Elmas (Elmas Hemshere) lived, was a stone’s throw away. On my first evening in Watertown when I called him, he immediately invited me to their home. We were both extremely happy for our coming together. Brother Bilezikian was the very first Christian minister I had the joy of meeting in the USA. He took a fatherly interest in me, asking me to attend the Armenian Brethren Church in Watertown the following Sunday and relate to the fellowship my conversion experience. I shall not forget that Sunday when I spoke for the first time from a pulpit in America. The congregation, almost all of whom ― except for the young ― had come from Anatolia, listened with keen interest. This was the start of a long friendship. Brother Bilezikian wanted me to study at some school in New England. He and his wife drove me to Providence, Rhode Island, where he got in contact with the dean of Providence Bible College. After explaining my intention to eventually serve the Lord among Turkish people he was able to obtain a financial arrangement with the school for which I am ever grateful to him. A few years later, both husband and wife were promoted to glory. Their sweet memory is ever fresh in my mind. While studying at Providence, many weekends they would invite me to their home and church. This was one of the many couples – they had no children – whose support and assistance in the USA I will gratefully remember until the day I die. I am now in my eighty-fourth year of life. I thank the Lord for his assistance in enabling me to go over this book and put it into fresh form, along with my wife Lila, whose contribution to this work was invaluable. On my countless visits to the Bilezikian home Reverend Vartan would passionately recount his many experiences from the days of his youth in Turkey until moving to the United States in 1912. During our talks, I encouraged him to put his rich memoirs into writing. Many others induced him to do the same. 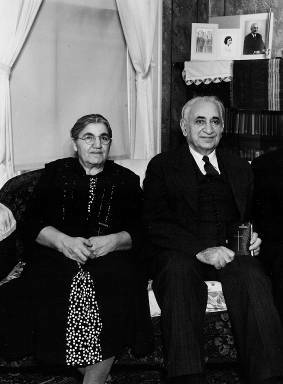 Brother Vartan was born in Marash in 1883 to Sarkis and Marta Bilezikian, being the last child (whose twin died in childbirth) in the family of five boys and one girl. The name ‘Bilezik’ means ‘bracelet’ in Turkish. Armenians in Anatolia bear trade names. Very likely, one of his progenitors was a bracelet-maker. Sarkis was an early convert to the evangelical faith. He became instrumental in establishing the first Armenian Evangelical Church in Marash, ‘Birinji Kilise’ (First Church), as it was called in Turkish. Vartan was a capable tailor by trade, had little education but was conversant in three languages: English, Armenian and Turkish. He had no experience in writing until he wrote this, his only book, ‘Apraham Hoja of Aintab’. He went to be with the Lord in the Armenian Nursing and Rehabilitation Center in Jamaica Plain, MA, in 1972. God had his gracious hand on him. Vartan experienced glorious revivals, preached widely in Anatolian cities and won many to Jesus Christ. After landing in the USA, he did extensive itinerant preaching. House meetings conducted around the Boston area eventually developed into the Armenian Brethren Church in Watertown. Brother Socrate Amiralian, also from Marash, was working with him. Vartan faithfully ministered in this church for many years. Some time after his arrival in the USA, he met Elmas Melkonian, who was from a village between Marash and Aintab. She was working as a cook at the Perkins Institute for the Blind in Boston. In her Vartan found the beloved companion of his life. She was to stand with him very faithfully until the Lord called her home after a prolonged illness. During his later years Brother Bilezikian acted on the many requests and began writing this book in Turkish with Armenian characters. This was the improvisation of the language used by Armenians in the Ottoman Empire. Many of these people did not know their own Armenian language. This worthy production was put into Armenian, printed and sold to numerous Armenians around the world until the supply was exhausted. Many of them remembered their endless afflictions and, at the same time, heartening experiences related here. The book is not available anywhere today. When this book came out in Armenian, it was considered a great lack not to produce such a valuable source of information in English. I wish to introduce you to the person who did the original English translation, which will offer further background about this valuable memorabilia. It was my joy to be acquainted with Brother Krikorian. I could have never thought that one day, my wife Lila and I would make a minor, but important contribution for the presentation of this book on the Internet. We both thank God for this privilege. We updated it linguistically and stylistically. Afterward we checked about some details with various sources, including the relatives of Vartan Bilezikian, all of whom we thank for their assistance. This story is now added to the rostrum of several noble accounts from Anatolia, once a land of glory. These can all be found at our website: www.cosmades.org. Our sincere wish is that those who read it will catch a vision for evangelism, be gripped to pray for Turkey and the conversion of the Turks, as well as for the many messengers of the Good News who labor there. I have known Rev. Bilezikian for over thirty years. Besides being together on a missionary journey the best part of a year following WW I (1914-1918), which covered eight states in America and several provinces in Canada, I have spent months at a time in his hospitable home in Newtonville, Massachusetts, while sharing a church-building operation with him and also preaching and ministering to his congregation. Consequently, I have come to know him most intimately as a brother in Christ, a warm and genial friend, a near relative and an esteemed servant of the Lord; a man who hazarded his life unto death and endured the tortures of the Turkish prison for the sake of the Gospel. In the course of our association, I listened in private and in public to his poignantly dramatic and extraordinary experiences of apostolic nature. The more I heard, the more I became convinced that here were experiences and testimonies that should be made available to the reading public. Certainly the Christian church ought not to be deprived of a so gripping and soul-stirring message. Therefore, at every opportunity I kept before my brother the idea of a book, fanning into flame the smoldering fire of his own desire. Nor was I alone in this; others here in America as well as in the Near East — the seat and source of the text — joined in the call for the writing of such a book. The Rev. Mr. Bilezikian was born in Marash, Turkey, in the year 1883, the son of godly parents, his father being a scholarly minister. At the age of fifteen, he accepted Christ as his Lord and Master; and his manner of preaching the Gospel has been apostolic, in that, like Paul the tent-maker, he has worked with his own hands and supported himself, laboring for the perpetuation of the faith without financial recompense. He is an accomplished tailor, and only in recent years, on account of a pilgrimage to the gates of death, retired from business activities. Happily, however, this has been rather a gain, in that it furnished the freedom so necessary for the task of writing. In the goodness of God restored to reasonably good health, he has accomplished what many have hoped and prayed would some day be done. Early in the spring of 1951, Mr. Bilezikian wrote me that the manuscript was ready for publication in the Armenian language, and asked what I thought of an English edition. Judging from the warm reception the messages received during our missionary journey, and on other similar occasions, I had always visualized a welcome acceptance of such a book in English-reading circles. At once, therefore, I gladly endorsed the idea, little realizing, however, the part that would be mine in this endeavor. For he wrote me back: “If this book is to appear in English, you are the one to translate it.” Here was a piece of work, a spiritual drama, the scenes of which were very close to my heart. Shortly thereafter, while on a preaching mission in metropolitan Boston, a conference with Mr. Bilezikian resulted in the task of translation being prayerfully undertaken. The best part of two months, averaging eight hours a day, was devoted to the work, while the translator was established in the comfortable home in Newtonville. This afforded the advantage of easy access to each other for conference and consultation—prime requisites for such an engagement, as this translation asked of the translator not only his mind, but his spirit and his heart as well. The author allowed the translator the broadest of latitude in executing into English the original manuscript, and meticulous care has been exercised to preserve the atmosphere without sacrificing the color of the original text. Whenever need of extension was deemed advantageous such as supplying Scriptural references which did not always appear in the manuscript to support statements of facts and claims, they have been freely supplied. As the English of several hymns was not available, the poetry was composed from the prose. However, as these extensions have received the author’s imprimatur, no need has been felt to indicate them in the text. Also, it should be noted that the translator has made avid use of new material that has come to light since the original manuscript went to press. The title of this English edition, the dedication, and the chapters in their present form, with the acquiescence of the author, is the work of the translator. It is the judgment of both author and translator that they adequately serve their purpose. The author and the translator have become collaborators, each welcoming the thoughts and words of the other—the translator enjoying complete autonomy with the full cooperation of the author. I owe my thanks to the author for having conferred on me this distinction and honor, which, in spite of all the labor entailed, has been a rich and rewarding experience. This translation is offered with humility. If a tithe of the blessing that has come to me shall be the portion of the reader of this book, then author and translator alike shall rejoice in this labor of love. M. P. K.